Sami Al-Haddad, the Lion of Bahrain, is well-known to be the first Mr Olympia amateur winner and world champion overall winner in 2011. He is a talented bodybuilder and spectacular personal coach. He is an IFBB PRO bodybuilder from Bahrain, and owner of Blacksmith Gym. Sami Al-Haddad lives in Bahrain and loves to travel all over the world. Sami likes to be recognized by the world as a bodybuilder and trainer. 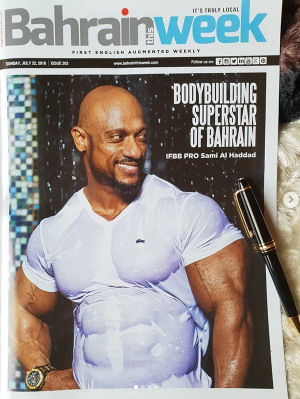 Sami Al-Haddad, as a Bahraini international professional bodybuilder, made history winning the gold medal in the IFBB Pro Spain in 2018. He paid great respect and gratitude to His Majesty King Hamad bin Isa Al-Khalifa, who called him immediately after winning the championship to congratulate him on his historic achievement. Sami also expressed the most profound gratefulness to HM the King’s Representative for Charity Works and Youth Affairs, Supreme Council for Youth and Sports (SCYS) Chairman and Bahrain Olympic Committee (BOC) President His Highness Shaikh Nasser bin Hamad Al-Khalifa for his congratulatory call. Sami is a very optimistic, social, friendly and much-focused person. He opened his gym, the Blacksmith Gym, in October 2016 to follow his passion for bodybuilding and to deliver to the world top athletes and world champion body builders. He is running his Sami the Blacksmith YouTube channel promoting his tips and tricks for anyone wanting to have a perfect body. Sami is also working with various bodybuilding brands, clothing brands and also appeared as a front page model and bodybuilding superstar for Bahrain This Week magazine many times. Samil Al-Hadid is the brand ambassador for different supplement production companies, and these supplements are provided throughout the Gulf Cooperation Council (GCC) alliance, the Middle East, Saudi Arabia, UAE, Oman, Kuwait and Europe. Sami is about to launch his supplement brand “Forge” very soon. Sami Al-Haddad keeps himself busy! Sami participated in the Tampa Pro show in August 2017, winning a silver medal. He competed in five bodybuilding tournaments in 2018, and no one could beat his level of powerful blasts. He achieved three silver and two gold medals this year. He practices a lot, and works hard to be a Champ on the road of bodybuilding. Recently, Sami Al-Haddad participated in Mr Olympia 2018 held on 15th of September 2018 with a weight of 210 pounds. He was very positive about it and had practiced hard to make it into the competition. Mr Olympia 2018 champion predictions were being made for 6 body builders: Lee Haney (’84-’91), Dorian Yates (’92-’97), Ronnie Coleman (’98- ’05), Jay Cutler (’06, ’07) and Dexter Jackson (’08) and seven-time winner Phil Heath. However, finalists of the Mr Olympia tournament were Phil Health and Shawn Rhoden from the USA. Shawn Rhoden went on to win the Mr Olympia 2018 trophy. Sadly, this time Sami was not shortlisted as a runner-up. Sami Al-Haddad is a very hardworking and brave person. He is one of those people who never gives up, facing the hardships of life boldly with a smiling face and open heart. Even after not winning the Mr Olympia competition, we believe he’ll be enjoying life with his son (Sultan) and daughter (Fawzia) and heading towards launching his new bodybuilding products and supplements business all over the world. We wish you good luck Champ!